Smart Card Crypto Kit allows to integrate any smart card and / or token in cryptographic applications such as, for example, digital signature applications, browsers for SSL authentication, email and Office products for digital signature and encryption of documents and emails, smart card logon to Windows and in many other applications that require the use of smart cards. 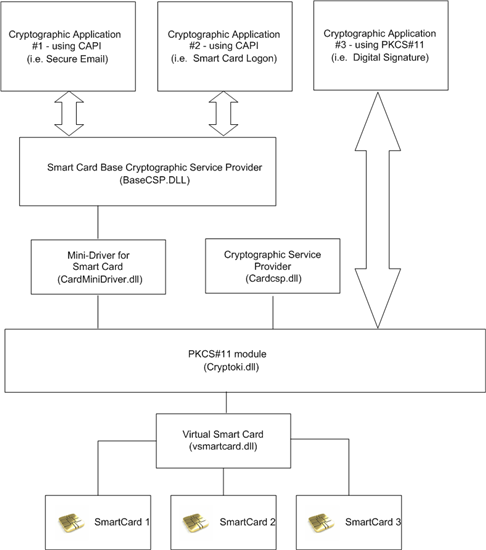 Smart Card Crypto Kit consists of a set of software libraries that implement PKCS # 11 interface , Smart Card Mini Driver and Microsoft CSP (Cryptographic Service Provider) for a generic (virtual) smart card and / or cryptographic token as shown in Figure at the bottom. The main module of the Smart Card Crypto Kit is the PKCS # 11 module on which both the Smart Card Mini Driver and the Cryptographic Service Provider are implemented. This module communicates with a virtual smart card implemented in the Virtual Smart Card module that can be customized for any type of smart card or cryptographic token. Starting from the base configuration we can integrate in the Smart Card Crypto Kit any smart card or token equivalent (also, a USB pen drive or a smartphone) equipping this token with PKCS # 11 interface and Smart Card Mini Driver making it available to all cryptographic applications. For more info contact us to one of the addresses in the About section.